Our congregation's history dates back to the days of the earliest settling of Monmouth County by the Dutch between 1670 and 1680. Most of the Dutch families came from Long Island and by 1699 there were enough of these families to have a regular preaching service; therefore, a congregation was organized in that year. Services were conducted in Dutch by three ministers from Brooklyn, each of them preaching on a rotating schedule. The three found this schedule exceedingly burdensome because of the "distance they were compelled to travel and the danger of crossing the great bay in small boats". 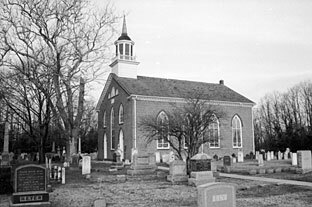 Our church records begin on October 9, 1709 when it was recorded in low Dutch, the Reverence Joseph Morgan was installed as pastor of the "Reformed congregation of Freehold and Middletown". The first church building of this congregation stood on what was then known as Hendrickson's Hill, near Hudson Street in the old village of Marlboro. In 1731, construction was begun for a larger place of worship on the site of the present Sanctuary. The congregation worshipped here for more than ninety years. In 1826 the building was taken down to make room for the present structure. The congregation also constructed a chapel in the village of Marlboro in 1869. That building, which still exists in Marlboro, was sold in 1969 when a new education building was constructed on the church grounds. Completed in 1970, it is now known as Volharden Hall.